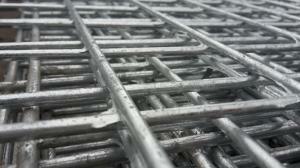 Galvanised welded wire steel mesh panels are available in 8ft x 4ft, 6ft x 3ft, 12ft x 6ft and 6ft x2ft sheet sizes. All our galvanised mesh panels are hot-dipped galvanised and made from steel wires ranging from 2.5mm, 3mm, 4mm and 5mm diameter wires. Choose from 1"x1", 2"x1", 3"x1", 2"x2", 3"x3", 4"x4" and 6"x3" mesh holes sizes. 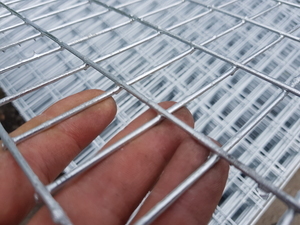 Weld mesh panels can be used for fencing, pond covers, security cages, aviaries, dog kennels and runs, fox-proofing, fruit cages, machine guards, on scaffolding and behind walls for added security. Each weld mesh panel is welded before being hot-dip galvanised to form a corrosion-resistant product that has a silver / zinc coloured appearance. 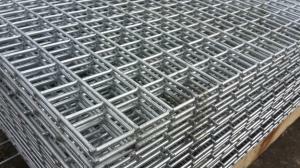 Our flat mesh steel sheets are available in many mesh sheet sizes, wire thicknesses and mesh apertures. Wire diameters range from 12swg, 10swg, 8swg and 6swg (wire gauges). 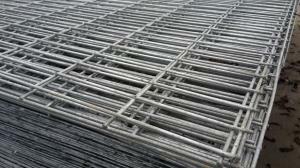 with mesh holes ranging from 25x25mm, 50x50mm, 75x75mm, 75x25mm, 50x25mm, 100x100mm and 150x75mm. The hot-dipped galvanisation process can result in some of the products having a rough texture. Although this is uncommon we advise all our customers to consider their intended application and use and whether rough textured metallic edges may cause an issue - this is an issue if children may be in regular contact with the mesh. 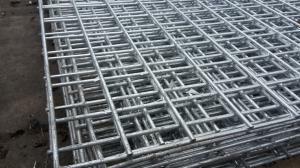 In most cases weld wire panels are smooth and cause no issues.